The Indian hyperlocal space isn’t exactly booming: TaskBob recently shut down, and LocalOye had fired employees last year. Food delivery companies have also struggled, with several downing shutters in 2016. And if the bruising competition and razor-thin margins weren’t bad enough, these companies now might have to contend with a big new player. 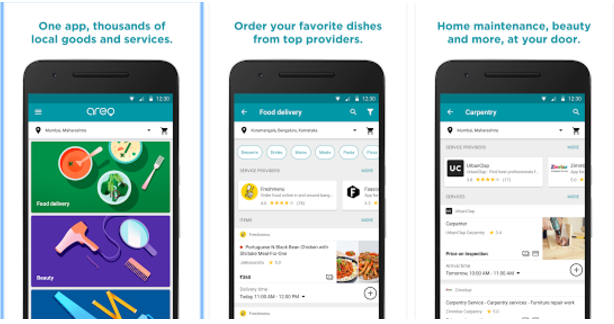 Google has quietly launched Areo, what it calls “one single app for food delivery and home services.” Its launch was without any fanfare, and the company didn’t even issue a press release. But Areo was spotted today on the Play Store, and it’s already live in Bangalore and Mumbai. While Google’s clearly gone ahead with a soft launch, it seems to have big plans in store for the Areo. “One app, thousands of local goods and services,” is how the company is choosing to market Areo, and it already seems to have some partners in place. The app allows users to place orders through Freshmenu, Faasos and Box8; other categories like beauty and repairs seem to be serviced mainly by UrbanClap. Users can combine orders from different companies within the same order, and which are then separately delivered by the respective companies. And there’s already interest around Areo – several users on the Play Store have asked Google to bring the app to their areas, and the app currently has a 4.1 rating. It’s this interest that’ll make some companies very nervous. Indian apps like Tapzo function on much the same concept of bundling together many apps into one, and if Google decides to use its vast financial and technological might to promote Areo, it’ll be hard to compete against. But Google’s found it hard to compete with incumbents in the apps space in the past. Allo and Duo, its consumer facing chat apps were launched on a much larger scale, but haven’t quite managed to dislodge Whatsapp. Also, hyperlocal services isn’t an easy space to crack in India – last year, Facebook had attempted to get a foot in the door by listing the contact details of service providers, but the feature lies mostly forgotten. It’s still early days for Areo, but the app will likely put even greater pressure on the margins of food delivery companies and home services providers. It’s unclear whether Google charges a commission for linking these services yet, but it’s likely it will in the future. Unless Google decides to aggressively promote Areo, it will command a audience that’s similar to the audience of say Freshmenu and UrbanClap, and adding a layer between these services and the end user will cut into the already-thin margins of these companies. Google will be hoping it can take Areo to an audience that was yet unfamiliar with online ordering apps — by increasing the size of the market, it can help both itself and the service providers which sign up on Areo. And if there’s one company that has the potential to do that, it’s Google.